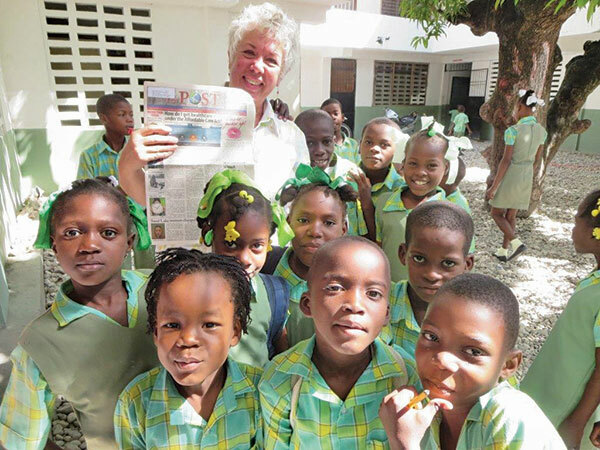 “On jou!” That’s Creole for hello, the language that is spoken in Haiti, where Jan Malmo, recently retired teacher at Tri County Schools, traveled recently on a mission trip, and took a Post with her. She was able to work with children and teachers in a school in Les Cayes for 3 days. Jan’s focus was to bring new ideas and teaching techniques to a small town in a third world country where they are open to everything because they have so little—little to no teacher training and little to no supplies. Jan said they primarily teach by reciting. She felt blessed to be welcomed by so many eager Haitians in a country where any help is appreciated. She saw God at work in the loving spirits and fellowship of people she could not really talk to without an interpreter. “It was an awesome trip and I hope to be able to go back annually with more teachers so more lives can be enriched (mine and theirs)!” she exclaimed. Thanks for taking us with you, Jan!